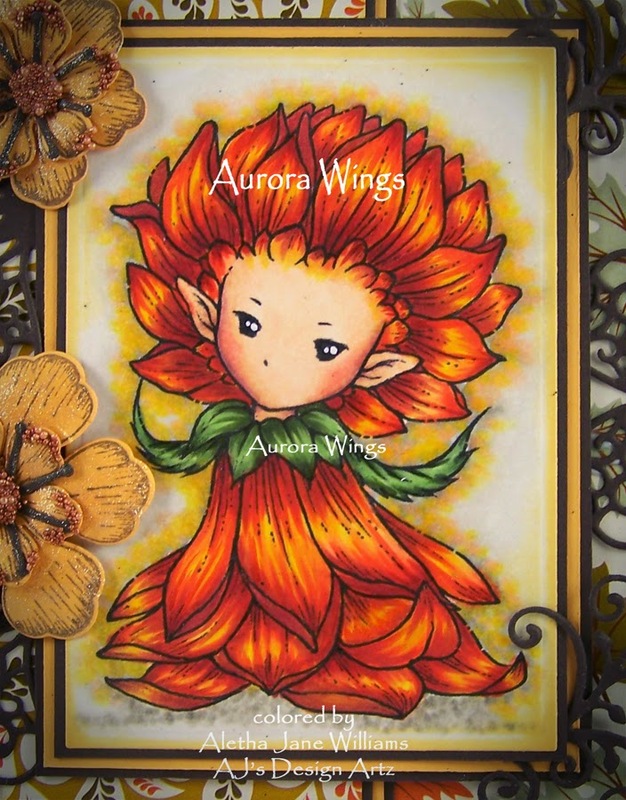 We have an amazing new challenge at the Aurora Wings Challenge Blog. I know that you are going to love this one. Our theme is “Sprite Delight.” See I told ya! I know that the world is in love with Mitzi’s sprites, and I know that a lot of you already have a growing collection of her digital sprites. Why not add one more and join our “Sprite Delight” challenge. Mitzi has given you that one more for your collection. Check out the blog. Now you have no reason for not entering our challenge. You can create anything you want, but your project must have a fairy or sprite and it must be hand colored. If you use an Aurora Wings Sprite you may enter up to THREE times, but those of you choosing from another company must limit your entry to ONE. Please remember your image must be rubber or digital and MUST be hand colored. Onward to my project! 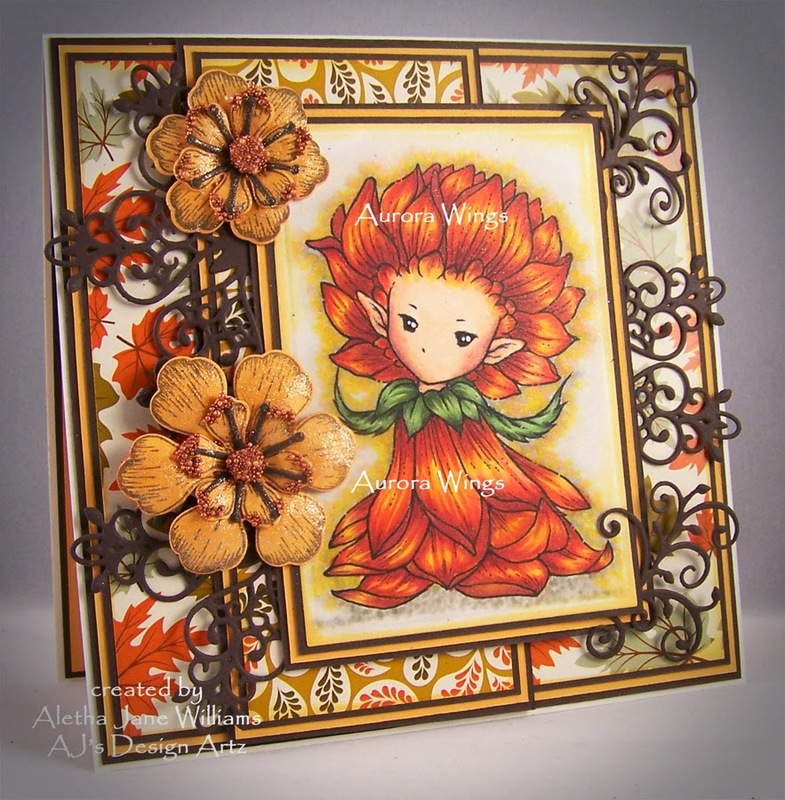 For my projects I decided to create with Mitzi’s Whimsical Dahlia Sprite. Isn’t she a cutie? 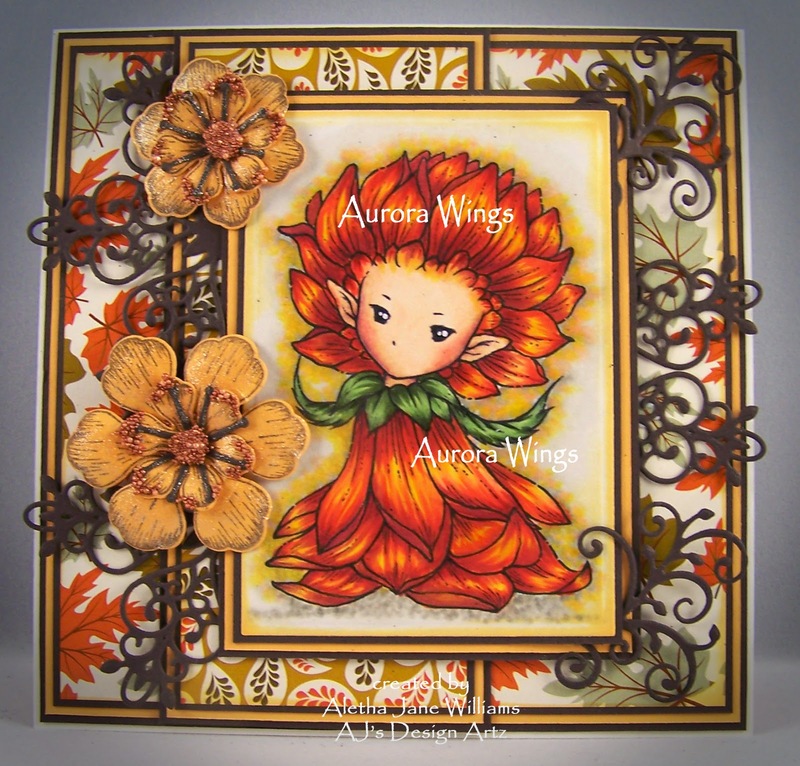 Dahlia Sprite was colored with Copics and then mounted on several pieces of cardstock. I got a little carried away with my Copic’s YRs. I wanted more yellow, but I guess I was feeling a little heavy handed that day. 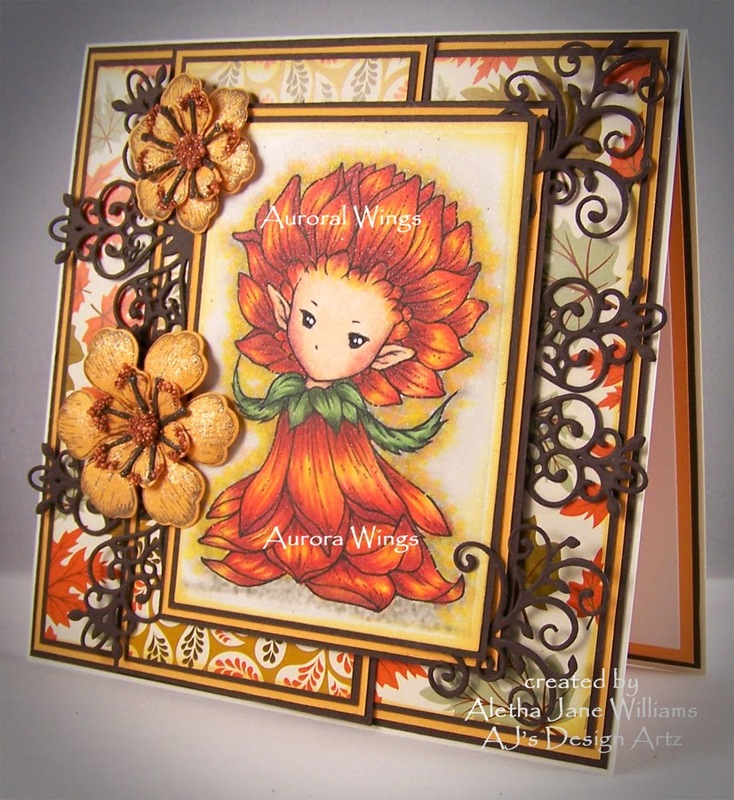 I had some fun with my new flower dies and stamps. This was the first time I used them so I still need a little practice. The links are listed below. I really appreciate all of you stopping by. If you need any further information you can contact me. This is gorgeous, Aletha! Incredible coloring and great flowers. Love the filigrees. I'm so tickled that you decided to enter it in our "Hand made flowers" challenge at Tuesday Throwdown this week. Good luck in the draw and hope to see you again next challenge. Glad you're gradually feeling better, Aletha. ^_^ The colors on this are so rich and luxurious. The way you colored the Dahlia Sprite's petals makes them look like glowing from within. Just gorgeous!! Oh my this is stunning as usual. Love your coloring and what a sweet image. I must go check those out. Thanks so much for joining us at Tuesday Throwdown Challenge hand made flowers. Beautifully colored image and lovely DP combined for a stunning card. Thanks for sharing it with us at Tuesday Throwdown Challenge. Good luck. Love what you have done here, and the texture stuff on the flowers is a great touch! Great card and art work!